Racers approaching a mountain on race day resemble Sherpas hiking up Everest. Most noticeable amidst a bag the size of a VW Bug (the classic one) and boots and poles are the two or three pairs of skis. Like racers who use specifically designed skis for various disciplines so having terrain specific skis will heighten the pleasure and skills of recreational skiers and amateur racers. As we know, skis retailers categorize skis as Fat, All-mountain, Race, Park and Pipe and Women’s specific. Manufactures further break down each category into classifications based on terrain and snow conditions. Matching your ski style to each category will help you decide if more than one pair of skis in necessary. When choosing another pair of skis ask yourself, where do you ski most often? Fat skis come in fat and super fat models for varied floatation and maneuverability. If you love an occasional tree run or steep chute, super-fat skis may inhibit your access. However, if you are more of an open bowl, deep powder rider super-fats might be just perfect. Twin tips further subdivide the category aiding in floatation and backcountry jibbing on some models. 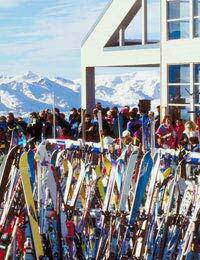 For access to the whole mountain manufactures created all-mountain skis. Narrower under foot, shorter and with more sidecut, all-mountain skis are designed for maneuverability. Mogul specific versions tend to have narrower tails and produce smaller radius turns. Tree skis are a matter of taste, but may be your softest skis, able to maintain snow contact and spring you out of terrain features. All-mountain skis will float in powder, though not as well as fat skis, and they will carve on groomers, though not as well as race skis. The advantage, though, is that they ski all types of terrain decently and perform in crud, mung, powder, ice, groomed and ungroomed snow. Race skis go fast…on groomers. Tradition says that longer is better, but is no longer the case. Lengths depend on your discipline and ability to control the ski. Slalom are the shortest and most responsive, then GS, super G and downhill skis. Stiffer and heavier to reduce chatter, race skis do not perform as well off piste in undesirable snow conditions as they do on groomers. Like race skis, park & pipe skis are highly specialized. Lightweight yet flexible and poppy, P&P skis ride and respond smoothly forwards and backwards. Narrow twin tips and center-mounted bindings differ from any other set up. P&P skis can be taken onto the mountain, however they are better designed for icy take-offs and landings and spinning/flipping aerial maneuvers. Some alpine ski manufactures have finally figured out that women are physically different from men, and ski the whole mountain. K2 and Dynastar in particular offer two lines of women’s skis that break down much like men’s or unisex skis with Fat, All-Mountain, Race and Park & Pipe categories. Engineers focus on aligning women’s rear centered mass over the sweet spot of the skis, while cutting weight and maintaining the necessary width, sidecut, strength and flexibility for each terrain specific design. Skis are designed to perform for specific genders (male, female, jr. male, jr. female), abilities (beginner, intermediate, advanced, expert), categories (fat, all-mountain, twin, race) and terrain (groomed, ungroomed, park/pipe, gates, bumps, powder). The first two do not change as you buy more specified skis; however, nuances in the category and terrain will lead to your multiple ski decision. Having conditions specific skis, like wearing the right shoes, can help your performance and enhance your experience.